A new study from UC San Francisco shows that junk food is even worse for you if you're chronically stressed. We’ve all heard countless times that stress is the number one underlying contributing to disease in America. And now, according to a new study published in the journal Psychoneuroendrocrinology, we can blame it (in part) it for making us fat, as well. Most of us assume that a combination of genetics and sugary, salty, high-fat foods lead to obesity. While that’s true, high stress levels exacerbate the problem considerably. The study monitored 61 healthy women over the course of a year. Of these women, 33 were under high amounts of stress, while 28 led low-stress lifestyles, reports Juliana Bunim at UCSF. In layman’s terms, that means our bodies are less effective at fighting off fat when you’re constantly stressed out. Add this to the fact that sleeping poorly makes you crave fatty foods, and it’s clear that one of the best things you can do to stay trim is chill out. Our advice? 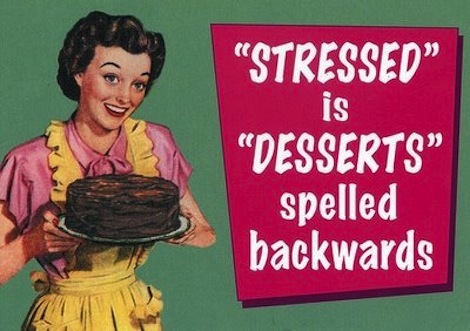 Try going on a stress diet instead of a food diet. It may be way more effective than cutting out that afternoon brownie.